Readers of my blog will be aware that for years I've pondered what is called the "destructive cycle" of xingyi's 5 elements: each is meant to be a foil for another in a kind of 5-way "rock, paper scissors". I'm not the first person to suppose that they can be (and were indeed intended to be) arranged into a looping 2 person form. While there are plenty of 2 person "destructive cycle" xingyi forms out there, not one follows the order of pi, zuan, beng, pao, heng (at least in a way that results in each attack being deflected and countered). Normally there are repetitions of pi or beng, or a completely different order. While some of the destruction cycle forms I've seen are really quite good, I can't help but feel that they haven't grasped the key to how the elements interact. One example I came across recently follows the order of the elements, but lets the pi quan (splitting fist) "land" (ie. it is not deflected). I think it is dangerous to groove a response that lets the pi quan through. A pi quan strike to the shoulder can be devastating. And we also know that pao quan should, in theory, negate the pi quan. Following my xingyi seminar I had some realisations about the application of the elements (based on ideas I've been mulling over for a decade or so). I realised that if I put those applications together into a 2 person drill they would each be an effective response to the other. The other night I successfully tested my theory as a 2-person drill - I had at last "cracked the xingyi code". I've ironed out a few things with the footwork since (the footwork really is the key - and the footwork is straight from the basic form of the elements). Applied xingyi footwork - the key to cracking the "xingyi code"
The interplay between beng quan and heng quan is quite fascinating and was one of the big "aha" moments in putting the drill together. Essentially the heng quan deflects the zuan quan, then answers with a curved strike (ie. the heng quan). Beng quan can then defeat heng quan by firing straight forward so that it stifles the heng quan. I've found that when you use your beng quan in this way it will usually have to be angled slightly differently from when it is used as a strike: in other words the beng quan will serve primarily as a deflection rather than a strike. 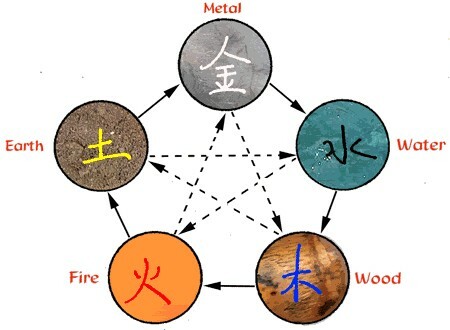 "Heng Quan is considered to be neutral, or the center of the Five Elements. It is located centrally between Yin and Yang, and constitutes a bridge between them. In the Five Elements, it is like a ball rolling and belongs to Earth... Everything grows from the Earth." You will note from my solo drill that I actually fire out 2 beng quan in succession. I feel this is entirely consistent with the 5 elements. In many schools beng quan is performed in precisely this way, namely there are 2 beng quan punches, one with the reverse arm, then another with the leading arm. Luo De Xiu (who practises the xingyi of Hong Yi Xiang) does precisely this in the video below at 2:53 to 2:55. It is that second beng that is answered by pi quan. That solo form is looking pretty good Dan! Thanks very much for your presentation on the five elements. I posted one of your videos and a link to your site on "Dojo Rat" today. I really appreciate it John! I think I commented a while back on one of your posts would be months ago though. My school has a destructive sequence 2 man training set which does not use blocks or allows blows to "land" but uses footwork to avoid attacks. Each person follows the cycle. Each movement involves a defensive and offensive component none are used purely as deflections or defense. This is our most basic of two man sequences and is the cornerstone of our foundational training. After becoming competent in it we encourage students to forget the paper, scissors, stone method of the destructive sequence and experiment using each movement against all the others, ending in a two person free movement training drill which we call wu xing jiaoshou (5 elements fighting), though the "fighting" is still under controlled conditions. If you wish to change the "side" then one person changes leading hand and foot on pi and you continue the sequence with the opposite hand/foot positioning. Thanks for your comments Paul - I look forward to seeing your drill!